Mount Tangkuban Perahu Panorama Tourist Attraction in West Java – This time we will review about one of the attractions in West Java, Indonesia. A volcano that is still active today and known as Mount Tangkuban Perahu. Mount Tangkuban Perahu is located in Lembang, West Java Province in Indonesia. 20 km to the north of Bandung city. With coordinate point 6.77 ° South Latitude 107.6 ° East Longitude. The height of Mount Tangkuban Perahu itself reaches 2,084 meters or about 6,837 feet above sea level. This mountain is included in the category of stratovulcano mountains, with eruption technique is quite unique, ie from east to west. Mount Tangkuban Perahu has a very abundant sulfur content, proven when the eruption in 2013, this mountain issued various types of rocks, and accompanied by lava and sulfur. 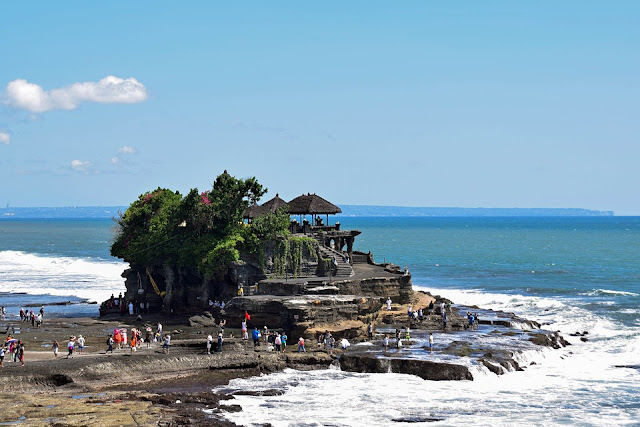 Until now, the status of the tourist attraction in West Java is still supervised by the Directorate of Vulcanology. Some crater conditions on this mountain also strengthen the active status of Tangkuban Perahu. At some point the area of ​​Mount Tangkuban Perahu found hot springs. And in normal circumstances, this mountain also removes sulfur vapor. Temperatures of Tangkuban Perahu Mountain tourist attraction generally reaches 17 ° C at noon, and 2 ° C at night. Mount Tangkuban Perahu tourist area surrounded by a row of beautiful forest. Starting from the dipterocarp forest, montane, to the ericaceus forest that presents spectacular scenery and make thousands of pairs of eyes fascinated. This unspoiled natural beauty will make the heart calm and the mind becomes fresh. There is a unique legend story about Mount Tangkuban Perahu. Even this legend is well known in the wider community. 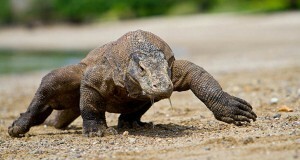 This legend is also believed as the origin of the formation of tourist attraction in West Java. In ancient times lived a beautiful woman. Thanks to her beauty, she is respected by many people. The woman is called Dayang Sumbi. Dayang Sumbi lives in a jungle with his son Sangkuriang, and a beloved dog named Tumang. Actually the Tumang is none other than the father of Sangkuriang, but he did not know it. One day, Sangkuriang went hunting deer with her beloved dog that is Tumang. But unfortunate, until the sunset, sangkuriang not get the quarry. He is afraid to go home, because it can upset his mother. Sangkuriang decided to kill the Tumang and bring his meat home. Arriving at home, ladies Sumbi was warmly welcome the arrival of his son. He immediately cooked the meat brought by Sangkuriang. Once cooked, they also enjoy it together. But not yet finished the meal with her son, Dayang Sumbi was aware of the absence of the Tumang. He asked his son about the whereabouts of the Tumang. Nervously and fearfully, Sangkuriang admitted that the meat he brought was a dog flesh that was none other than Tumang. Dayang Sumbi was very angry at Sangkuriang. He hit his beloved child, even pelted him with stones so that the head of the child. Dayang Sumbi decided to expel Sangkuriang. After Sangkuriang leaves, Dayang Sumbi feels sorry for what he has done. She always cried, and prayed to be reunited with her beloved child. He asked for longevity and youth in order to meet with sangkuriang. Dayang Sumbi prayer was granted, he remains beautiful and ageless despite his age is old. Once upon a time he met a very handsome young man. The young man was fascinated by the beauty of Dayang Sumbi. Dayang Sumbi also felt amazed by the good looks of the youth. They both had a love. The handsome young man asked Dayang Sumbi to be his wife. And at the same time, Dayang Sumbi saw the same scar on the young man’s head with the scar on Sangkuriang’s head. Dayang Sumbi was shocked and panicked. He told the boy, that he was his mother. But the young man did not believe, because where might a mother still look like a girl. Dayang Sumbi tried to explain to the young man that he believed, but the young man doesn’t care, even the young man insisted to marry Dayang Sumbi. Dayang Sumbi also felt confused, he finally give terms that are not logical on the youth. If he wanted to marry her, he had to make a lake with a huge boat overnight, on the pretext that he wanted to sail the next day. Heard the request of Dayang Sumbi youth was confused, but because of his love, he also aggred. 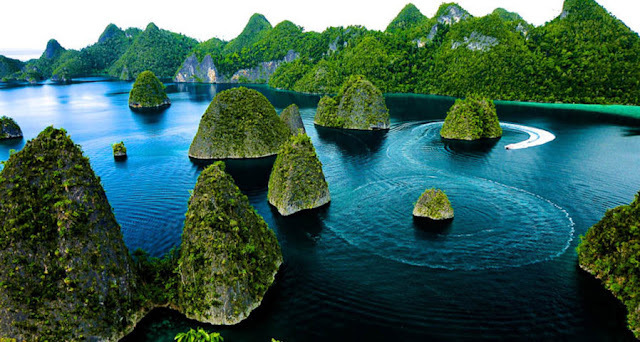 The young man, who was none other than sangkuriang, persistently made the lake with a very large boat. Toward the morning, Sangkuriang’s work is almost complete. But on the other hand, Dayang Sumbi pray for, the sun rises faster. And finally Dayang Sumbi prayer was granted, the sun rises faster and Sangkuriang has not managed to finish the job. Sangkurian was angry and kicked the boat he had made upside down right in the middle of the lake. From the boat upside down, then called Tangkuban Perahu. Indeed, if we look closely, the shape of this mountain resembles an inverted boat. To get to the Mount Tangkuban Perahu tourist attraction is very easy. For those of you who come outside the area, you can tansit first in the city of Bandung. From Bandung city you need to travel towards Subang, precisely heading north from Bandung. Distance of about 12 mile only. And no need to bother, when there are many public transport ready to wait for you, if you do not bring a personal vehicle. On the way to Mount Tangkuban Perahu, you will be greeted by a flock of pine trees that line up with a sturdy. As well as a stretch of green tea gardens will add to the beautiful atmosphere of your trip. Mount Tangkuban Perahu has erupted several times. This causes the formation of craters are quite a lot. But among the craters, there are 3 craters are most famous than others. 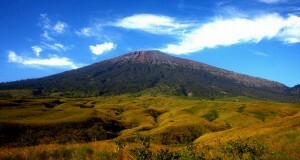 They are the Upas crater, domas crater, and the ratu crater. 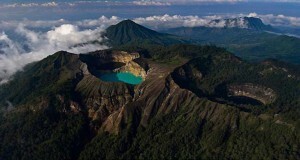 Among the three famous craters on the Tangkuban Perahu mountain, the largest is the Ratu crater. As the name implies, this crater seemed to be a queen in the area of Mount Tangkuban Perahu. Its beauty, can attract the tourists who visit. Beautiful scenery you can see here. With a cloud of sulfur fumes from the crater, and combined unique color yellow stones that adorn the area around the crater. In addition to presenting a beautiful scene, this crater is also very easy to pass, so no wonder if visitors always took time to come to him. By private car, or by rental car. Once there, you can get around on horseback. This crater is a wooden fence, because it remembers the extreme depth of the crater. In addition, around the area of ​​the crater Ratu, lined stalls – kiosks that sell a variety of mountain-style souvenirs. Such as masks, hats, gloves, scarves, and also handicrafts made of wood. There are also food stalls that provide food to pick up a hungry stomach. Furthermore there is a Upas crater located adjacent to the crater Queen. Upas crater looks more shallow and small, the road that is passed to get to this crater is also not easy. You must pass through a sea of ​​steep sand. So no wonder, visitors in the Upas crater only a handful of people, considering the field is quite difficult. And the last one is Domas crater. This crater is different from other craters in the area of ​​Tangkuban Perahu. Here you can see the crater from a very close point. In contrast to the Ratu crater who can only see from a distance and bounded wooden fence. In the Domas crater you can test the hot crater, by boiling the egg. Very interesting and worth a visit. Around Tangkuban Perahu mountain area, overgrown with Manarasa trees. This tree is red and leaves efficacious to treat acute diarrhea. But unique, Manarasa leaves are believed to make a person young. Appropriate legend of Dayang Sumbi, who always eat this leaf, so he remains beautiful and youthful. The city of Lembang has a typical food of glutinous rice. As the name implies, this food is made from sticky rice cooked as usual, with a mixture of a little coconut milk and spices, which distinguish the grilled ketan that is here after cooking, this sticky rice in a small wrap with banana leaves, and then burned. The aroma is very tempting, with a delicious flavor, so that makes the lovers addicted. Enjoying the grilled ketan usually combined with a cup of warm coffee, which can add taste. Besides ketan bakar, there is also know milk. Incomplete taste if in town Lembang you do not hunt culinary that can shake tongue. There is also Oncom Raos. Bandung specialty made from processed fermented beans. For souvenirs, you do not need to bother because the city of Bandung is famous for the city of fashion. Well there’s nothing wrong if you want to visit paradise clothes, this is the place. Starting from t-shirts, dress, kid’s clothes and many others. Of course with super quality and friendly price. So do not miss to hunting clothes, if you have arrived in Bandung. In addition to T-shirts, you can also hunt for a variety of interesting handicrafts as souvenir. Starting from woven bags, bamboo hats, vases, baskets, until the plate is there. Certainly qualified, beautiful and will not drain your pockets. In order for your tour to the tourist attraction in West Java is more convenient, Here is the tips that can be used as your tour reference to the area of ​​Mount Tangkuban Perahu. Hire a guide, to facilitate your tour through this tourist area. Prepare warm clothes so you do not get cold. Wear boots to make your trip easier. Use a mask to protect you from a disturbing sulfur smoke. Wear goggles to block the flying dust.